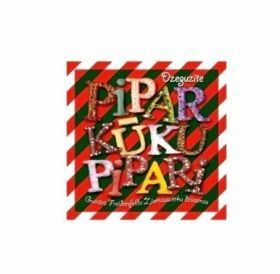 With a fun event on December 1st, at the ‘’Spice’’ shopping center the new album “’Piparkūku Pipari” release was celebrate.” The most popular kids’ pop group is the performer of the album. There are 18 songs composed by Gunars Freidenfelds and lyrics written by poets such as, Mara Cielena, Imants Lasmanis, Ojars Vacietis, Vilis Pludonis, Uldis Auseklis, Jazeps Osmanis and other well-known poet works. Album was recorded at the Latvian Radio with producer Maris Lacis. The director of ‘’Dzeguzīte’’ is Daila Martinsone. Some songs were featured with other performer’s one of them being Andris Danilenko. Album mostly includes new and unheard Christmas songs, such as ‘’Cela uz Ziemassvetkiem’’ (On the way to Christmas), ‘’Eglīte’’ (Christmas tree), ‘’Maršs visiem Jaungadiem’’ (March all the New Year’s), ‘’Ticība’’ (Belief) and many others. Album released Microphone Records. Supporters of the album FF Fond. Along with the presentation of the album there was an opening of the biggest large scale gingerbread exhibition from Iļguciema bakery on the second floor called “Pepper the Dwarf Christmas shop.” Outside of the ‘’Spice’’ shopping mall everyone has a unique chance to see two reindeers’. In addition, there is a Christmas store located outside with different farmer’s market goodies that you can see, taste and enjoy.